Buffalo-NiagaraGardening.com > Garden Walks > Work is done in Buffalo front garden competition– Is that a hosta I see? 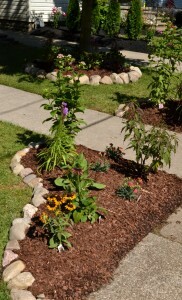 Work is done in Buffalo front garden competition– Is that a hosta I see? A shady front yard at 87 Newman Place, Buffalo. Murray Brothers Nurseries, which has 350 varieties of shade-tolerant hostas, ready to do a makeover. 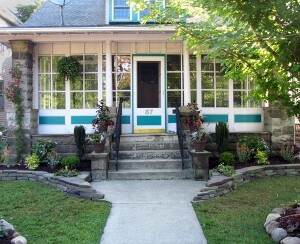 A homeowner who wants color– but no hostas! Work on the front yard was completed last week, and we won’t keep you in suspense a moment longer. Yes, the homeowners love their newly designed front gardens! 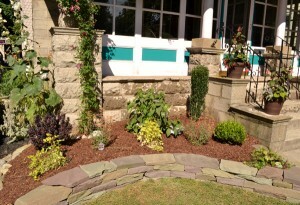 And yes, the designer used hostas, but you have to look hard to find them because they are so small. The makeover was part of the second annual Front Yard Garden Competition held as part of the National Garden Festival in Buffalo. Murray Brothers and other members of the Western New York Nursery & Landscape Association donated their services to transform 15 yards facing the Frederick Law Olmsted-designed Cazenovia Park in South Buffalo as part of the competition. You can take a look at all the yards and vote for your favorite. Hurry, voting ends this Friday, July 22. Having their yard chosen for the makeover “was like winning the lottery,” said Richard Speth. He’s originally from Buffalo and returned to Western New York after retiring as an electrical engineer. His wife, Trish Rusk, a retired nurse, is originally from California, and wanted lots of color. The shadiest part of the yard is directly underneath the Autumn Blaze maple that Speth planted five years ago. “The tree doesn’t look like much now, but in the fall it’s the most beautiful tree you’d ever want to see,” he said, which is why he wanted to keep the tree. The leaves turn from green to red to russet to brown and orange. Murray Brothers was able to introduce color even under the tree. 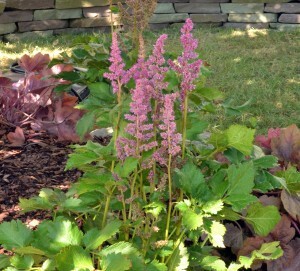 The crew used astilbe, the pink flowers in the photo above left, and heuchera, the plant with the great purple leaves. Another garden bed was created on the sunny part of the yard opposite the tree. Two other beds were created along the sidewalk. In the photo at right, you can see one bed situated where the homeowners’ walk (in the center of the photo) meets the public sidewalk. 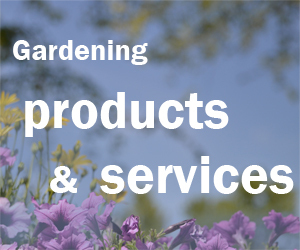 The plants in those beds include ‘Little Joe’ Eupatorium dubium (Joe Pye weed), Gayfeather ‘Floristan’ violet, dianthus ‘Chili’ PPAF (pinks), ‘Sonora’ black-eyed Susan, ‘Cherry Brandy’ rudbeckia and hibiscus. Does she like even the Blue Mouse Ears hostas that Perrin tucked in here and there? “Those little babies? It’s a cute plant,” Rusk said. She explained that her objection to hostas is that they are often used to fill up space. Since her house faces the park, “I have enough green,” she said. 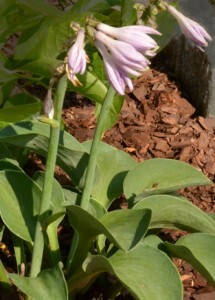 The Blue Mouse Ears, shown near the beginning of the story, is a variety of what local authors Mike Shadrack and Kathy Guest Shadrack have dubbed “little hostas.” They include “small,” “very small” and “mini” varieties of hosta. Rusk said she’s tickled with the makeover Murray Brothers produced. You can see the symmetrical raised beds in the first photo, as well as in the photo above left. The bed includes dwarf boxwood, purple clematis, golden bleeding heart, ‘Sky Pencil’ holly, ‘Happy Trails’ tiarella, hydrangea and Agastache ‘Apricot Sprite’ Anise Hysop. The bed was created using stacked stone. 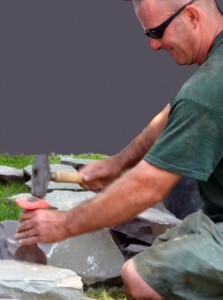 At right, Bob Grover of Murray Brothers skillfully chips stones to fit. The crew also used a saw to cut some stones. Below right, you can see how tightly the stones fit together. No mortar was used. 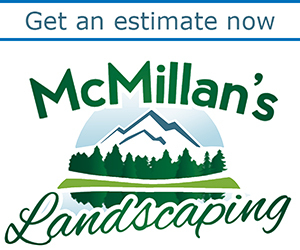 Murray Brothers Nurseries offers free landscaping estimates as well as trees, shrubs, perennials, pottery, water garden supplies and more.